Italy: The Lateran Treaty between Mussolini and the Vatican is signed, establishing an independent Vatican City State and giving the church money and restored authority over marriages/families in exchange for recognition of Mussolini's Fascist government. Benito Mussolini (right) reads his credentials prior to signing the Lateran Treaty on behalf of King Victor Emmanuel III. 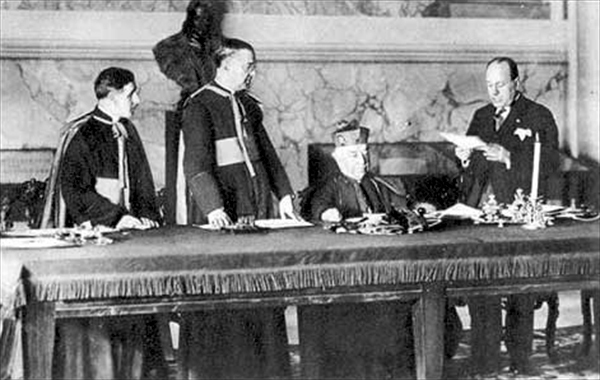 Cardinal Gasparri (seated), signed on behalf of Pope Pius XI. The Roman Catholic Church had lost all its property in the 1870 unification of Italy. Its authority, power and influence had been seriously eroded over the years. Although Mussolini had no real love for the church, he took advantage of the situation to consolidate his power, propelling him to his highest level of popularity, not only throughout Italy, but with some 400,000,000 Catholics worldwide. Even the worst despot needs as much support of the people as he can get, and this treaty gave it to him big time, opening the door for his Fascist regime to get away with a lot of despicable things in the coming years. CBI - China: Day 147 of 154 of the Japanese Invasion of Manchuria. CBI - China: Day 15 of 41 of the 1st Battle of Shanghai. CBI - China: Day 42 of 142 of the 1st Battle of Hebei. Spain: Day 210 of 985 of the Spanish Civil War. Germany: Austrian Chancellor Dr Kurt von Schuschnigg meets with Hitler in Berchtesgaden, Bavaria. Austria agrees to become a protectorate of Germany, governed by Hitler. Spain: Day 575 of 985 of the Spanish Civil War. CBI - China: Day 220 of 2,987 of the 2nd Sino-Japanese War. Day 5 of 124 of the Battle of Henan. Spain: Day 940 of 985 of the Spanish Civil War. CBI - China: Day 585 of 2,987 of the 2nd Sino-Japanese War. Finland: Day 74 of 105 of the Russo-Finnish War. In southern Finland, Soviet troops finally breach the Mannerheim line, forcing the Finns to withdraw to a secondary defense line. CBI - China: Day 950 of 2,987 of the 2nd Sino-Japanese War. Day 89 of 381 of the Battle of South Guangxi. Day 15 of 67 of the Battle of Wuyuan. ETO - UK: Day 159 of 258 of the Blitz. Hanover, Germany, is bombed by the RAF. East Africa: Day 247 of 537 of Italy's East African campaign in the lands south of Egypt. British troops advance into Italian Somaliland. East Africa - Eritrea: Day 7 of 56 of the Battle of Keren. CBI - China: Day 1,316 of 2,987 of the 2nd Sino-Japanese War. Day 13 of 31 of the Battle of South Henan. CBI - Thailand: Day 134 of 221 of the Franco-Thai War (Vichy France vs Thailand). Atlantic: Day 29 of 169 of Germany's Second "Happy Time," during which U-boats sink 609 Allied ships with little risk. Day 1 of 3 of the German Channel Dash (Operation CERBERUS). German warships anchored in France make a daring run through the Channel, up the North Sea, and to the safety of Kiel, Germany. Russian Front - North: Day 157 of 872 of the Siege of Leningrad. Russian Front - North: Day 4 of 102 of the Battle of the Demyansk Pocket, another failed attempt to break the siege at Leningrad. Russian Front - North: Day 20 of 103 of the Battle of the Kholm Pocket. Another attempt to break the siege at Leningrad. Russian Front - Center: Day 35 of 103 of the Battle of Vyazma, Russia. Russian Front - Center: Day 35 of 103 of the Battle of Sychevsk, Russia. Russian Front - South: Day 105 of 248 of the Siege of Sevastopol, Crimean Peninsula. All German attacks against Sevastopol are stopped for the winter. CBI - Burma: Day 60 of 164 of Japan's Invasion of Burma. Japanese troops cross the river Salween. This causes concern for the 17th Indian Division who are ordered to hold firm on the river Bilin. CBI - China: Day 1,681 of 2,987 of the 2nd Sino-Japanese War. Day 50 of 99 of the 3rd Battle of Changsha. CBI - Java: Day 13 of 17 of the Battle of Singapore. PTO - Borneo: Day 58 of 107 of the Battle of Borneo. PTO - Philippines: Day 66 of 152 of the 1st Battle of the Philippines. 5th Air Force provides air support. Russian Front - North: Day 522 of 872 of the Siege of Leningrad. Russian Front - North: Day 2 of 51 of the USSR's Operation POLAR STAR, a failed offensive north of Leningrad, hoping to take the southern shore of Lake Ladoga, Russia. Russian Front - North: Day 2 of 4 of the Battle of Krasny Bor. Soviets fail to recapture this strategically important town near Leningrad. Russian Front - North: Day 283 of 658 of the Siege of the Kholm Pocket, USSR lays siege to the Kholm Pocket but the Germans hold out for a about a year and a half. Russian Front - South: Day 62 of 69 of the USSR's Operation LITTLE SATURN. A successful drive into the Northern Caucasus and the Donets Basin pushing the Axis troops out. MTO - Tunisia: Day 87 of 178 of the Battle of Tunisia. RAF and US Air Forces provide Allied air support. CBI - Burma: Day 53 of 104 of the 1st Battle of Arakan. US 10th Air Force provides air support. CBI - Burma: Day 4 of 79 of the Allied Operation LONGCLOTH. CBI - China: Day 2,046 of 2,987 of the 2nd Sino-Japanese War. PTO - Alaska: Day 250 of 435 of the Battle of Kiska, Aleutian Islands. PTO - New Guinea: US 5th Air Force B-17s carry out a predawn harassing strike over Rabaul on New Britain Island. PTO - Solomon Islands: US 13th Air Force bomb the airfields at Munda on New Georgia Island and Vila on Kolombangara Island. ETO - Germany: US 8th Air Force B-17s bomb at Frankfurt, Ludwigshafen and Saarbrucken. ETO - France: US 9th Air Force B-26s bomb the marshalling yard at Amiens. Russian Front - North: Day 648 of 658 of the Siege of the Kholm Pocket. USSR lays siege to the Kholm Pocket but the Germans hold out for a about a year and a half. Russian Front - North: Day 29 of 48 of the Battle toward the Narva River, Estonia. This drive helped lift the Leningrad siege and goes on to liberate Narva. Russian Front - North: Day 10 of 191 of the Battle of the Narva Isthmus, Estonia. Russian Front - North: Day 29 of 33 of the Battle of Luga, Russia. Taking this town west of Leningrad will open the door toward Estonia. Russian Front - South: Day 50 of 113 of the USSR's Dnieper-Carpathian Offensive in southwestern Ukraine. Russian Front - South: Day 13 of 31 of the Battle of Nikopol, Ukraine. Russian Front - South: Day 19 of 25 of the Battle of the Korsun Bulge in Ukraine. German relief forces are now just 10 mile from Korsun. Russian Front - South: Day 16 of 16 of the Battles of Rovno and Lutsk, Ukraine. This Soviet victory has increased the gap in the German line from 70 to 110 miles wide. MTO - Italy: Day 26 of 123 of the Battle of Monte Cassino. US troops at Cassino are relieved by Indian and New Zealand forces. RAF and US Air Forces provides air support for the Allied ground troops. MTO - Italy: Day 21 of 136 of the Battle of Anzio. The Allies are pushed back to a final defense line at Anzio. RAF and US Air Forces provides air support for the Allied ground troops. CBI - Burma: Day 44 of 99 of the 2nd Battle of Arakan. CBI - Burma: Day 7 of 19 of the Battle of the Admin Box. US 10th Air Force provides air support. CBI - China: Day 2,411 of 2,987 of the 2nd Sino-Japanese War. Japanese aircraft bomb Namyung putting the airfield out of use for several days. PTO - New Guinea: Day 146 of 219 of the Battle of Shaggy Ridge. 5th Air Force provides air support. PTO - New Guinea: Day 143 of 162 of the Battle of the Huon Peninsula. 5th Air Force provides air support. PTO - New Guinea: Day 59 of 597 of the Battle of New Britain. US 13th Air Force provides air support. PTO - Solomon Islands: Day 103 of 295 of the Battle of the Bougainville Islands. US 13th Air Force provides air support. ETO - France: Day 195 of 284 of the Battle of Brittany. ETO - France: Day 150 of 236 of the Siege of Dunkirk. ETO - Germany: Day 4 of 16 of Operation GRENADE, the US drive into Germany. US 9th Air Force provides air support. ETO - Germany: Day 4 of 17 of Operation VERITABLE, the British and Canadian drive into Germany. ETO: Day 23 of 66 of the Battle to the Rhine. US 9th Air Force provides air support. ETO - Germany: US 8th Air Force B-24s attack the oil depot at Dulmen. Russian Front - Finland: Day 150 of 223 of the Lapland War. Finland and Russia have joined forces to kick the Germans out of Finland's most northern province. Russian Front - Center: Day 120 of 206 of the Battle of the Courland Pocket in Latvia. Russian Front - Center: Day 18 of 75 of the Battle of Königsberg, East Prussia (now Kaliningrad, Russia). Russian Front - Center: Day 16 of 17 of the Battle of Rastenburg, East Prussia. Russian Front - Center: Day 17 of 63 of the Battle of the Heiligenbeil Pocket in East Prussia. Russian Front - Center: Day 2 of 54 of the Battle of East Pomerania, Germany. Russian Front - Center: Day 4 of 17 of the USSR's Lower Silesian Offensive (Poland). Soviets surround the fortress city of Küstrin on the Oder. Russian Front - Center: Day 11 of 31 of the Battle of Schwedt, Germany. Russian Front - South: Day 106 of 108 of the Battle of Budapest, Hungary. The Soviet siege continues. CBI - Burma: Day 24 of 61 of the Battles of Meiktila and Mandalay. The US 10th Air Force provides air support. CBI - Burma: Day 22 of 39 of the Battle of Ramree Island. The US 10th Air Force provides air support. CBI - Burma: Day 8 of 99 of the Battle of Pakokku and Irrawaddy River operations in central Burma. The US 10th Air Force provides air support. CBI - Burma: US 20th Air Force B-29s and B-24s bomb storage dumps near Rangoon. CBI - China: Day 2,777 of 2,987 of the 2nd Sino-Japanese War. US 14th Air Force attacks targets in China and sinks two cargo vessels out in the South China Sea. PTO - Alaska: US 11th Air Force B-24s fly air cover for a naval task force. PTO - New Guinea: Day 412 of 597 of the Battle of New Britain. PTO - New Guinea: Day 296 of 481 of the Battle of Western New Guinea. PTO - Philippines: Day 115 of 299 of the 2nd Battle of the Philippines, aka the Liberation of the Philippines or the Philippines Campaign. PTO - Philippines: Day 59 of 244 of the Battle of Luzon. 5th Air Force provides air support. PTO - Philippines: Day 12 of 22 of the Battle of the Bataan Peninsula. 5th Air Force provides air support. PTO - Philippines: Day 9 of 29 of the Battle of Manila. Great historical fiction, the fifth in Phil Ward's "Raiding Forces" series, written by a combat-hardened veteran.